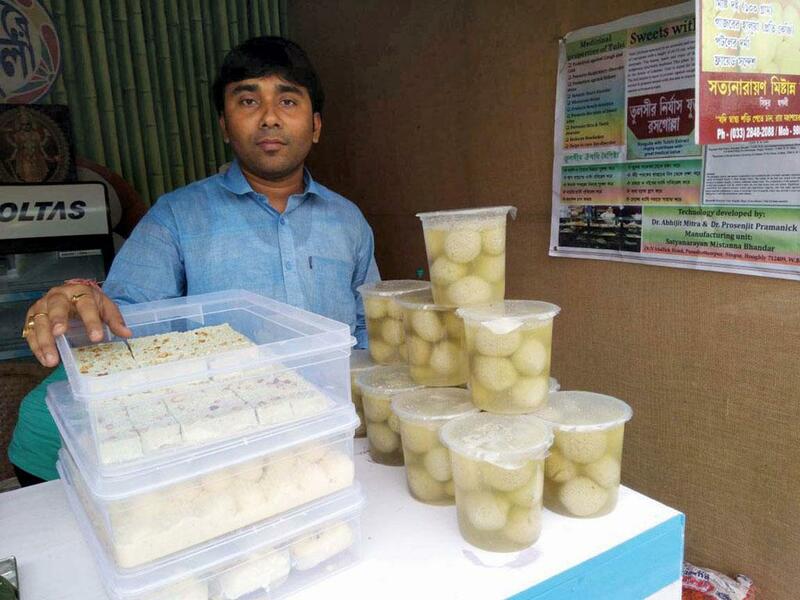 A comparatively young breed of entrepreneurs in West Bengal is taking the state’s iconic dish rosogolla to a whole new sweet level. These men, some of whom have quit their fancy white-collar jobs to pursue their passion for sweets, have innovated the dish to attract a rather elusive group—the health-conscious and the weight watchers. The traditional rosogollas, which recently acquired the Geographical Index (GI) tag, are white, spongy, luscious cheese balls that remain soaked in sugary syrup. “But many, particularly the youth, remain wary of rosogollas’ sugar content due to concerns like diabetes and obesity,” says Sitangshu Roy, one of the entrepreneurs, sitting in the 60-year-old Satyanarayan Mistanna Bhandar in Singur town in Hooghly district. Sitangshu has inherited the sweet shop from his great-grandfather. “This prompted me and my two brothers to innovate a healthy alternative that people can gorge on without guilt,” he adds. In 2014, Sitangshu’s brother Abhishek quit his job at Infosys in Bengaluru “to re invent and expand” the family business. The two brothers, in their early 30s, also involved their third brother Arunangshu, 22, to create tulsi rosogollas—light green balls with the therapeutic values of holy basil and the sweetening from stevia leaves that cuts the calorie intake by half. Abhishek says, the sweet is “as delectable as original rosogollas”. However, creating this unique product was not easy. A lot of research went into maintaining the pH balance of the cottage cheese (derived by curdling milk with lemon juice) that imparts the right mix of taste and health, and prepare the proportion of tulsi leaf residue and its filtrate that need to be added to the sweet. “I was impressed by their enthusiasm, and together we conducted a pilot experiment,” says Abhijit Mitra, senior scientist of the University of Calcutta, who along with junior scientist Prosenjit Pramanick guided the Roy brothers in their innovation. To prepare the sweet, the Roy brothers first collect freshly plucked tulsi leaves in large numbers which are then shade-dried and then ground. A specified proportion of leaves of stevia is also dried and powdered. While the stevia leaves are purchased from a horticultural nursery at Arambagh, there is no dearth of tulsi in the Roy brothers’ native village of Haripal, around 17 km away. The powdered mixture of tulsi and stevia leaves is then boiled in sterilised water for about 20 minutes and left overnight to settle after which it is filtered using a cheesecloth. The tulsi residue left behind is added to the kneaded lump of cottage cheese in a specified proportion and made into light green balls, which are then boiled in large cooking vessels containing filtrates of tulsi and stevia leaf powders. To enhance sweetness, lightly sweetened syrup with 10 per cent sugar content as compared to the regular ones is added to the boiling cheeseballs. And presto! Soft, fluffy, taste bud tickling rosogollas are ready. The Roy brothers have priced the tulsi rosogollas at Rs 10 each—the same as the regular ones of identical size. According to Arunangshu, from an earlier sale of plain rasogollas worth Rs 10,000–R11,000 per day, the figures have more than doubled on an average during the past 7-8 months with the introduction of tulsi rosogollas. The brothers began selling the sweet in March 2017. Since June 2017, Abhishek has opened a branch of Satyanarayan Mistanna Bhandar at Dankuni, about 20 km away, and has started selling the tulsi rosogollas. “Our sales have tripled since,” says Abhishek, who along with others in the research team has published a study paper about the goodness of the new dish in the November 2017 issue of the international Parana Journal of Science and Education. Tulsi rosogolla is high in ascorbic acid (that fights cold and cough), antioxidants, vitamins and minerals as calcium, potassium and magnesium. It contains 48.68 per cent more protein as compared to its original counterpart, while the fat and sucrose content is low by 32.74 and 9.43 per cent, respectively, notes the study paper. The brothers have inspired others who initially started by selling sweets from the Roys. One such is Shankar Pramanik, a 35-year-old investment professional. Since August 2017, he has been preparing and selling tulsi rosogollas in his home district of Howrah. 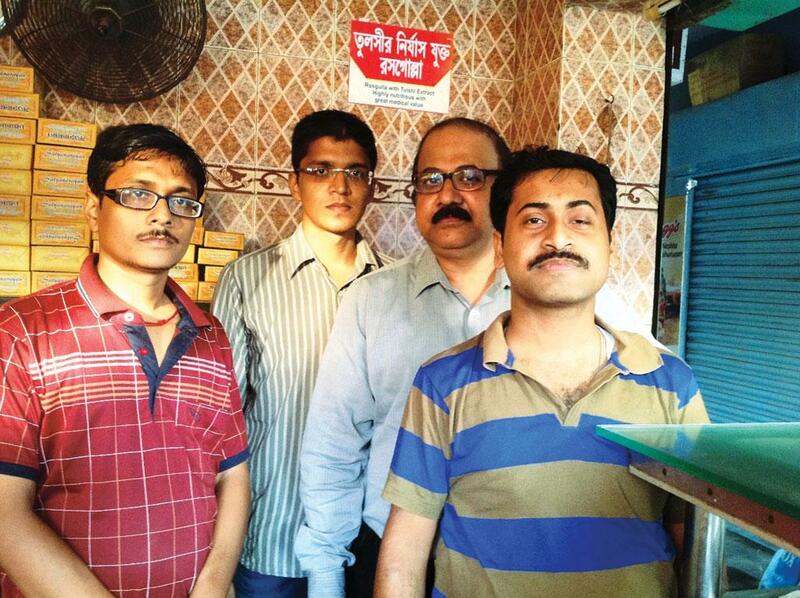 Two confectionery shop owners—Ramkrishna Ghosh and Chandicharan Pal —from Belgachia and Baguiati localities in Kolkata have also plunged into the trade. Mitra has now been approached by other entrepreneurs from as far as Bengaluru and Goa who had visited the Ahare Bangla 2017 food festival, where the brothers were invited by the state government to put up a stall for free. Even the customers at the food festival were seen relishing on the sweet. “I love rosogollas, but could not have them as much, because of diabetes. But today, I can eat them to my full, leaving it to tulsi and stevia to take care of my health,” says Radha-mohan Pal, a customer. Did you know fermented foods have rich microbial diversities?